Chilime Hydro Power Company Limited published a notice about the written exam for open and internal competition on various dates. On notice, they published the date and time of the written exam but announce that exam centers will be published on 2075/05/17 at their site www.chilime.com.np and on office's notice board. The written exam is going to take the different technical post of level 5,7,8 and 9. 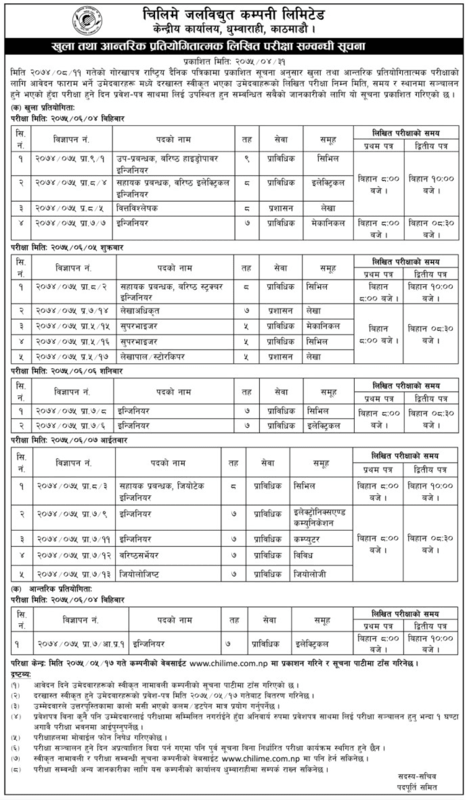 Check Chilime Hydro Power Written Exam Schedule Notice 2075 below which published at Gorakhapatra on 2075/04/31.